Why Buy a Dow Used? It is finally here! The 2017 Civic Si is now available at Dow Honda! Our display model is currently this striking model, shown in the “Energy Green Pearl” paint colour. Under the hood, it is powered by a 1.5L, 16-valve, Direct Injection, DOHC, turbocharged, 4-cylinder engine with a 6-speed manual transmission. Its average fuel economy is 8.4/6.2/7.4 L/100km (city/highway/combination). 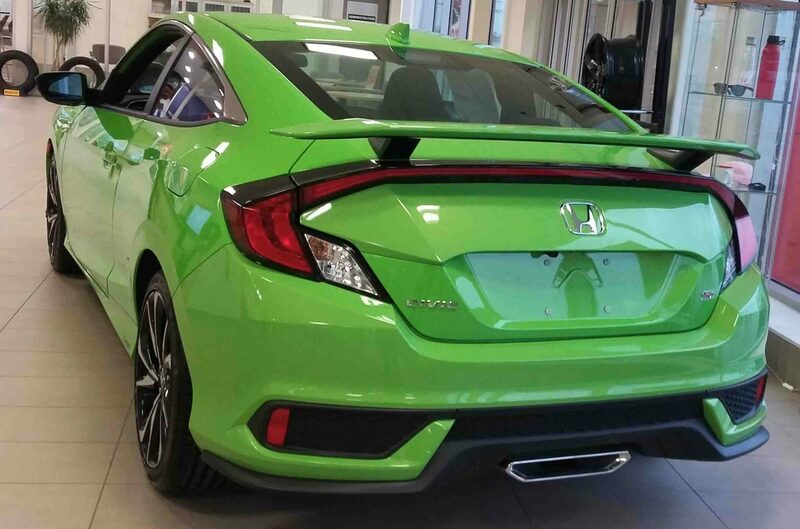 The 2017 Civic Si sets itself apart with its centre exhaust finisher and a rear wing, taillight-integrated rear spoiler. Its exterior is further embellished with body-coloured bumpers and door handles, front splash guards, and 18 inch aluminum-alloy wheels. The Si’s seats feature red stitching, and the Si logo, and the back seats fold down. It also includes a power moonroof, acoustic windshield, and aluminum-trimmed sport pedals. 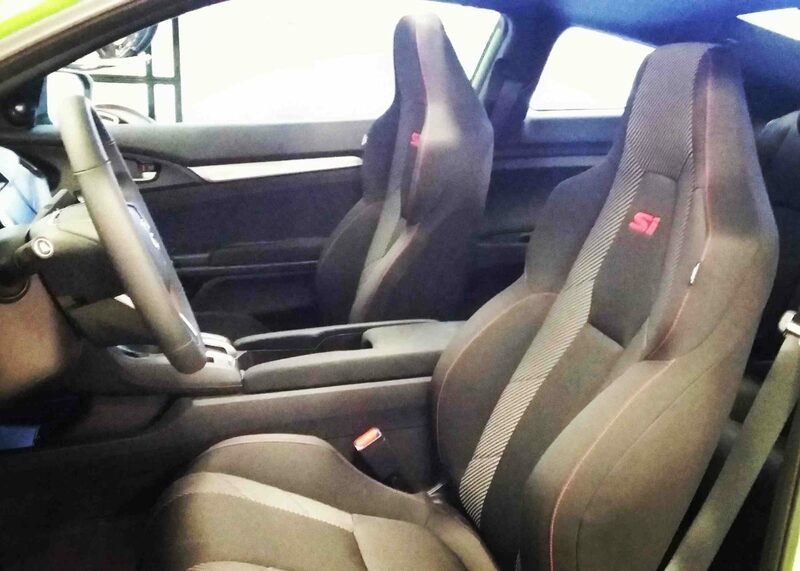 If you’re looking for technology, then the Civic Si has you covered! 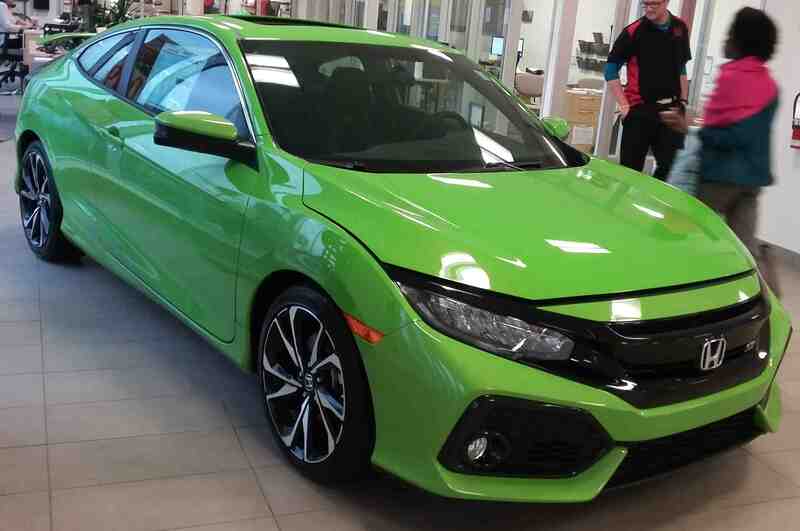 It comes with the HondaLink Assist Emergency Response System, LaneWatch blindspot display, a multi-angle rearview camera, and the Honda Satellite-Linked Navigation System! For entertainment, there’s HondaLink, Apple CarPlay, Android Auto, Bluetooth Streaming Audio, HD Radio, and SiriusXM compatibility. In addition, the Si has 2 USB connectors, WiFi tethering, wireless charging, proximity key entry, and pushbutton start! If you have any questions about the 2017 Civic Si, click here to contact us! If you would like to book a test drive, click here! Click here to see pictures of the 2017 Civic Hatchback! Speak with one of our Sales Reps Today! Closed Friday April 19 (Good Friday). Open Saturday April 20 and Easter Monday April 22. By submitting your email address or phone number, you allow us, Dow Honda, to include you on our contact lists to send you information about our products, services and promotions. You may revoke consent at any time by clicking on the "Unsubscribe" link in your email.